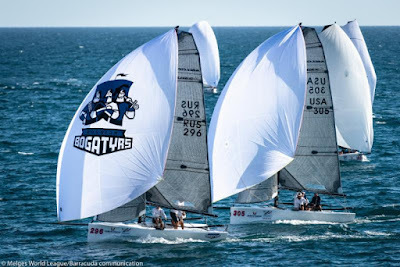 Cagliari, Italy (October 12, 2018) - Three additional races were completed today at the 2018 Melges 20 World Championship hosted by Yacht Club Cagliari. This brings the number of completed races to six, which also prompts a discard of each teams worst score. With the results shuffled and settled, Italy's Filippo Pacinotti (Manu Weiller, tactician) at the helm of BRONTOLO remains in the lead for a second consecutive day. Lurking in second place is Igor Rytov's RUSSIAN BOGATYRS (Kostantin Besputin, tactician), and defending World Champion Drew Freides' PACIFIC YANKEE (Morgan Reeser, tactician) sits third. The third day of scheduled racing brought fireworks to the race course as the air grows more intense, and the Class prepares to crown the next World Champion. The first race of the day (Race Four) got underway in 10-15 knots of breeze out of the South with Pacinotti picking up where he left off Thursday, collecting another bullet - his second of the event. Achille Onorato's MASCALZONE LATINO JR. (Paul Goodison, tactician) achieved his best score thus far crossing the finish line in second place, followed by Rytov. Rytov rallied back to win Race Five taking over the event lead. Things 'got real' for Pacinotti as a mid-fleet finish temporarily slipped him back into second place. American Alexis Michas at the helm of MIDNIGHT SUN (Mark Mendelblatt, tactician) found a ray of light to finish second. Stefano Visintin racing KINDAKO (Matteo Ivaldi, tactician) was another new face that found his way to the forefront of the fleet to take third. Freides reminded the fleet that he is the reigning World Champion with a phenomenal win in Race Six. Right behind him, Rytov crossed the line to take second. Pacinotti's third place finish was enough (with the overall discard) to put him back into the event lead. Dario Levi's FREMITO D'ARJAand Oleg Evdokimenko's KOTYARA finished the race in fourth and fifth respectively. Although all eyes are on the top three, and the high-anticipation as to who will be the next Melges 20 World Champion almost unbearable, there is the impressive first Corinthian player seated in fourth overall. Russia's Alexander Mikhaylik and his all-amatuer crew aboard ALEX TEAM delivered an all-top-ten-finish performance today, sending him up the charts and into the top five. Vladimir Prosikhin's NIKA is in fifth. Looking ahead to the final day of racing in Cagliari, one thing is clear. Every team in the top three is in contention for the title. At this point, nothing is impossible. But to quote the 1986 British-American fantasy, action-adventure film Highlander - there can be only one. The final day of World Championship racing resumes on Saturday at 13.00.